Joseph Marshall is the Founder and Executive Director of the Warrior Institute. Joe is Natinixwe (Hupa) and Karuk, and grew up on the Hoopa Tribal reservation. At Hoopa Valley High School, Joe excelled in academics and basketball earning a Gates Millennium Scholarship and staring on a team in 2000 that made it all the way to the state championship. While at Humboldt State University, Joe was awarded “Man of the Year” for the 2003‐2004 academic year. 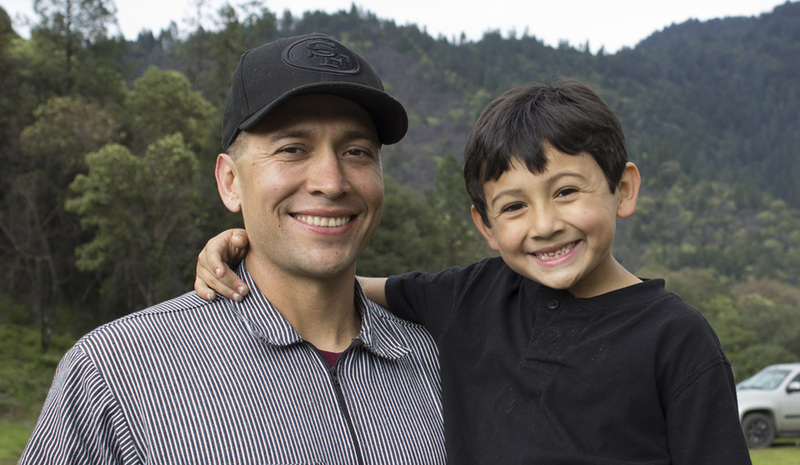 After graduating from Humboldt State University with a teaching credential, he returned to the Valley to raise a family and teach at Hoopa Valley High School, where he coached boys’ varsity basketball, taught PE, weight training, and is currently the Cultural Connections Teacher. Joe is a certified CrossFit instructor, whitewater guide, farmer, and all around great guy. Ramone splits his time between his native Hawaii and the Hoopa area with his family in tow. He has degrees in Psychology and Social Work, and has worked extensively in vocational training and developing life and career skills for youth. Ramone uses his contagious positive energy to be a master motivator. A certified CrossFit instructor, Ramone is the Fitness Program Director and helps coordinate the Warrior Institute’s Hupa CrossFit gym. An excellent athlete, Ramone paddles competitively in Hawaii and coaches football. He strongly believes in youth empowerment and the development of holistic life skills. He has personally seen the power of mentorship and coming of age rituals to transform lives for the better. Nelia Marshall serves as the Culture Pathways Manager, which includes the Traditional Skills, Language, and Arts Programs. Nelia is was raised in Hoopa where she lives with Joe and their family, and she is of Natinixwe (Hupa) and Karuk ancestry. She has a passion for creative art and photography and is learning traditional basketry. Nelia holds a Bachelor’s degree in Art Education from Humboldt State University. Tyler Mitchell (Yurok) was born and raised in Hoopa California. After graduating from theCommunity College of the Redwoods in 2012, Tyler completed Bachelor’s Degree in Recreation Administration with Minor in Native American Studies and Business Administration from Humboldt State University in 2014. Tyler works as the Recruitment and Job Placement Specialist at Hoopa Higher Education and also as the Academic Advisor/Retention Specialist. He enjoys working with local college students and assisting them with their academic needs. Tyler’s hobbies include playing baseball, basketball, gym, food, fitness, outdoors, family, youth, and gardening. Tyler started participating in Warrior Institute events in 2012 and has now stepped up into the role of Outreach Coordinator, which makes good use of his friendly and enthusiastic nature. Tyler is excited to be part of the Warrior Institute team and making a positive difference, creating much needed opportunities in the community, making connections, and building relationships. His motto is work hard and play harder! Guylish Bommelyn descends from the Dee‐ni and Karuk peoples in his ancestral homelands of Northern California. He is an enrolled member of the Smith River Rancheria of the Tolowa Tribe. He grew up steeped in the culture and language of his peoples. He is also a member of a ceremonial family and learned at a young age how important his responsibilities are for the continuance of those he descends from. He holds culture, ceremonies, and language in the utmost reverence. Guylish has been instrumental in helping his community improve their health and wellness. His focus on nutrition and physical activity and strength have changed the way his people live their daily lives for the better. Through his outdoor activism he has continued his work for the communities’ health and our environmental wellness as well. He is CrossFit enthusiast and trained whitewater river guide. Guylish grew up in a home where Dee‐ni' came before English. Language has always been an important part of his life. He began an active part in language restoration and continuance in high school. As an adult he became focused on teaching when he began working for his tribe. For the last 6 years he has been actively learning more language and teaching to the community and students. He has worked with groups from Head Start, High School, and community classes as well. Guylish is a natural teacher with patience and an ability of helping his students truly learn language and culture.